Pet Emergency? Call us right away at 209-465-5414! Welcome to West Lane Pet Hospital. Providing Full Service Veterinary Care for Stockton, French Camp, Weston Ranch, Manteca, Lathrop, Tracy, Lodi and the rest of the Central Valley for 45 years. Our services include Preventive Care, Emergency, Surgery, Dentistry and Microchipping for small animals. Our mission is to provide affordable and quality veterinary care. The doctor and staff at our hospital will deliver exceptional, comprehensive in-office care to make sure your pet feels healthy. We'll also make sure you have everything you need to keep your pet healthy and happy at home. We will provide you with personalized, gentle care and make sure you enjoy visiting us. Hope to see you soon. Our hosptial is fully equipped with exam rooms, in-house blood work, x-rays and surgery. Visit our Special Offers page for information about current promotions. Download and fill out the new client form to save time at check-in, and be sure to print out the coupons for savings. Call us for veterinary care. We are here to serve you 7 days a week. We are happy to offer a number of resources that enable you to learn about how to take better care of your pets. Please feel free to browse our site, particularly the informational articles. The best veterinary care for animals is ongoing nutrition and problem prevention, so becoming knowledgeable about preventative pet care is essential to the ongoing success of your animal’s health. If you have any questions, call 209-465-5414 or email us and we'll promptly get back to you. Our Stockton veterinarian office is very easy to get to -- and you can find directions on our Contact Us page! We also welcome you to subscribe to our newsletter, which is created especially for Stockton pet owners. 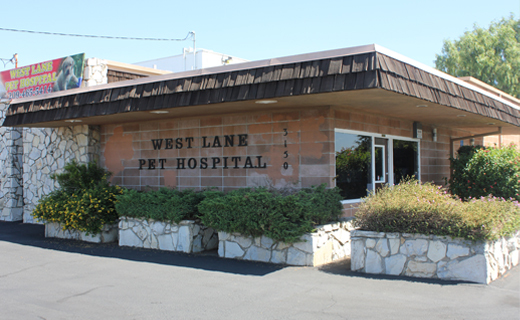 At West Lane Pet Hospital, we treat your pets like the valued family members they are.